The presence of water on Mars is often talked about in the past tense — as in, billions of years in the past. But researchers have found clues that water could be flowing in the present, at least during warm seasons. Researchers at Georgia Institute of Technology are looking at dark features on Martian slopes that are finger-shaped. They appear and disappear seasonally. These flows represent the best suggestion we know of that Mars has water right now, scientists say. The study is published in the journal Geophysical Research Letters. In 2011, Lujendra Ojha and his colleagues announced the evidence for possible saltwater flows on Mars. They published a study in the journal Science based on data from the HiRISE camera aboard NASA’s Mars Reconnaissance Orbiter. Arrows point to dark seasonal flows on Palikir Crater on Mars in this image from NASA’s Mars Reconnaissance Orbiter. As an undergraduate at the University of Arizona, Tucson, Ojha was the lucky one to spot irregular features in a Martian crater he was studying. He had no idea what they were. Researchers spent months figuring it out, and determined that the finger-like shapes could be briny water. “In HiRISE images, we see them forming, elongating and then fading over time,” Ojha said Monday. “That’s why they’re called seasonal — they form and flow when the temperature is right.” Since that study, Ojha has enrolled in graduate school at Georgia Institute of Technology, and continued studying the phenomena. He and Georgia Tech assistant professor James Wray looked more deeply at 13 sites with confirmed recurring slope features. This time they found chemical evidence supporting their earlier findings that water flows may appear and disappear on Mars with the seasons. In most cases, the possible water features appear to last for the equivalent of about two Earth months, Ojha said. 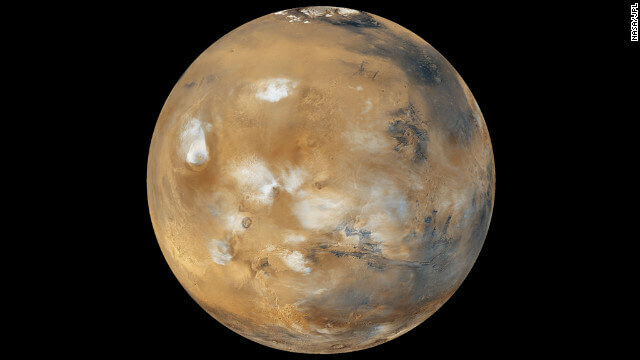 The researchers used the orbiter’s Compact Reconnaissance Imaging Spectrometer for Mars (CRISM) instrument to see if they could find more clues of water. CRISM looks for chemical signatures based on the fact that different substances absorb light at distinct wavelengths. Wavelengths can reveal a lot about what things are made of, Ojha said. Ojha and colleagues did not find direct evidence of water using the spectrometer method. Instead, they found light absorption features consistent with “something iron in nature” at the flows. The light absorption varied with season, however. The absorption bands are stronger when the features are forming and growing, and weaker when they fade away. An image of seasonal flows is combined with colors representing minerals in the area. “Something in these areas is actually causing the spectroscopic signature to fluctuate as well,” Ojha said.Water could explain these variations, Ojha said. Water in the seasonal flow would wash away small-sized grains — dust — and leave bigger grains. When water is not present, the bigger grains would remain, accounting for the changes in light absorption that researchers observed over time. The Nili Fossae region of Mars is one of the largest exposures of clay minerals discovered by the OMEGA spectrometer on Mars Express Orbiter. This image was taken in 2007 as part of a campaign to examine more than two dozen potential landing sites for NASA’s new Mars rover, Curiosity, also known as the NASA Mars Science Laboratory. Grain sizes could vary without water, though. The Martian atmosphere could also be responsible for some variation in the spectrometer data, because one season is dustier than another, but Ojha thinks there is something else going on. If there is water on Mars, it would be near to the surface and salty. Specifically, the flows may host an iron-containing mineral called ferric sulfate, a substance known to exist on Mars. Ferric sulfate would bring the melting point of ice down to a lower temperature, Ojha said. More research needs to be done to confirm this idea, obviously, but if there is briny water on Mars, could we drink it?